This is the revised edition of the book originally published by Yale University Press in 1996. 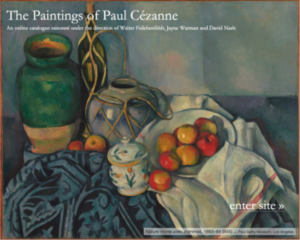 The special distinction of the book was the juxtaposition of photographs of the sites of Cezanne’s paintings with reproductions of the paintings themselves. Older, black-and-white photos by John Rewald and others were extensively supplemented by recent color photos by the author himself, always with the effort to reproduce the same angle and time of day of the painting, in order to provide a real sense of « landscape into art. » In the preface to the new edition, the author refers to numerous cites that have been identified since 1996, in Aix-en-Provence and l’Estaque, in Auvers and Pontoise, in Melun and along the banks of the Marne and in other places that have been important in identifying Cezanne’s movements, dating specific canvases, and illuminating certain aspects of his painting that had previously escaped notice. He mentions that he has eliminated some of the less interesting original material to make room for the best of the new and that his book is now more comprehensive, including additional documentary material ranging from postcards from the painter’s time to the author’s own more recent color photographs. I have never seen the original edition, and so I can’t describe more closely how this new edition differs from the old or recommend that people who have the first edition acquire the new one as well. I can say, though, that it’s an excellent book and that if you have the original, it would be well worth investigating the new version, and if you don’t, you should definitely consider buying this one. The reviews of the first edition here were uniformly positive (thirty-four out of thirty-five stars), and I can only add my own praise to those comments. This book does for Cezanne’s landscapes what the recent exhibition catalogue « The World is an Apple » did for his still lifes, i.e., it is a very close examination of the development of an important genre of the artist’s work, but since it is a monograph, both its perspective and its organization are more unified. Given that about half of Cezanne’s total oeuvre was landscape painting, one could argue that the evolution of his landscape technique is defining for the overall development of his art, and in fact many scholars have pointed to the basic similarities in structure between his landscapes and his still lifes. That similarity was even the object of another Cezanne exhibition that recently ran concurrently with the « Apple » one, the great « Site/Non-Site » display in Madrid, which concluded with an affirmation of Svetlana Alpers’s perception that « if Cezanne’s landscapes are like still lifes, so his still lifes are landscapes. » (Both of those exhibition catalogues are reviewed on this website.) 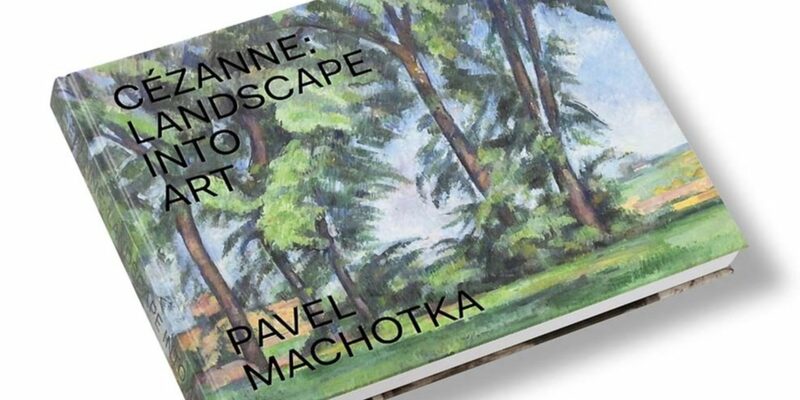 In any case, what Dr. Machotka has done in his book is nothing less than a careful and wonderfully lucid analysis of the development of the artist’s landscape style. In a few brief introductory chapters, the author deals with some preliminary issues. Chief among these is his critique of the purely formal approach to the artist’s work as represented by the familiar studies of Roger Fry and Erle Loran; in contrast, he emphasizes the vital role of the motif itself through an analysis of « Le Pont de Maincy » (1880). He discusses the « ultimately creative opposition » (16) in Cezanne’s work between paintings with a narrative intent and those based on observation; differentiates between normal, everyday looking and the kind of looking required by painting; and discusses the kinds of motifs that Cezanne favored and the technical devices he used to transform his visions into paintings. The ensuing chapters follow the four evolutionary stages the author discerns, i.e., 1865-74, 1875-84, 1885-94, and 1895-1906. I found both the overall trajectory and the reasons for the period distinctions completely convincing. In broad terms, what he is tracing is the evolution of Cezanne’s organization of the paint from the « parallel touches » of the early work (his equivalent to Theodore Reff’s well-known notion of the « constructive stroke ») to the larger color patches of the later work–and all that that transition implies in terms of compositional balance, resolution of pictorial tensions, color harmony, etc. Just to give one concrete example of his analysis, he discusses two views of the Bay of Marseille. The first, « La Baie de l’Estaque, » is from 1881-82, and its obvious organizational principle is the « parallel touch, » which « must serve to integrate surfaces that have almost nothing in common with each other [. . .] the water is painted with horizontal touches, the distant shore with touches that follow the slope of the rocks, » and when the greens representing pines and bushes « are used to balance the water surface [,] the touches are vertical » (85 f.), etc. The second painting, « Le Golfe de Marseille, vu de l’Estaque, » is from 1885, so we are no longer in the second of the stages mentioned above, but have entered into the third and are witnessing a change in style, essentially saying goodbye to the parallel touch, which has more or less outlived its usefulness: in this later painting, « the emphasis on intense color relationships took over from the orchestrating power of the parallel touch and made it superfluous » (86), i.e., we are on the road toward the larger color patches of the later works. Such observations of the author’s are easy to corroborate by reference to the copious reproductions provided as the discussion goes on, so one can see right away what he is getting at. Altogether. some seventy sites/paintings are discussed. The juxtapositions of photographs and reproductions are interesting and often compelling, but what I found to be even more instructive and illuminating are the writer’s careful, articulate descriptions of the paintings, which obviously benefit from his own experiences as an accomplished painter who exhibits regularly in Italy and his native Czech Republic. One senses the presence of something like a « painterly eye » in much of his commentary. When, for example, he finds that a tense and uneasy inclination in a painting is relieved by some balancing elements (126), or when he credits Cezanne with finding « a resolution which recognizes and respects the tensions it must resolve » (163), one feels that his identification of the problem and its solution may well come from having faced a similar dilemma in his own painting practice. But this obvious sympathy with the problems posed by the surface of the canvas is not the same as a purely formal analysis, for the motif is always palpably there and never lost sight of; one of the author’s basic tenets is that Cezanne always gives « equal due to his vision and his invention » (20), and his own analyses are from the same dual perspective, since he knows that the painter always has before him, in somewhat equal measure, both his motif and his canvas. But of course it’s never exactly 50/50: inevitably, Cezanne will sometimes favor the one and sometimes the other; that is consistent in his art, and it is probably only in the very late paintings, where the arrangement of the color patches is tending increasingly toward the abstract, that the pictorial needs of the canvas become a bit more liberated from the demands of the motif. In discussing the late patches as a flexible device that can do different things, Dr. Machotka points to the New York (Museum of Modern Art) version of the 1903-04 « Château Noir » and comments: « the painting is strongly tactile, musical in its implication, deeply, almost relentlessly, integrated. I sense in it a wholeness that transcends the appeal of the site — a balance created by the painter with carefully placed patches that refer to nothing at all but have a distinct pictorial purpose, such as the bit of yellow in the upper right corner which resonates with the patch of ground in the lower left corner and sets up a visual diagonal opposed to the massive one of the sliding hill » (178). I have given that rather long quotation as an example of the clear and articulate description that enables the reader to follow the comments on the paintings. I have gone on at some length in this review, because I am very enthusiastic about this book. I have been looking at Cezanne and reading about him for many years, but somehow I missed the publication of the first edition and am delighted to have a chance to acquire the book in its revised version. I recently wrote that « The World is an Apple » catalogue was close to the top of my stack of three dozen or so books on Cezanne, and now it is joined by this one. In addition to the fine text and excellent illustrations, the volume contains a list of paintings, a good selected bibliography, and a comprehensive index. This is simply one of the best books I have seen on Cezanne, and I can’t recommend it highly enough.